It is without any doubt that Seven Star Needle or Rose Cactus is one of the most interesting, unusual and exotic genera of cacti. A free-flowering perennial plant that produces highly ornamental flowers throughout the year in Malaysia, our beloved tropical country. 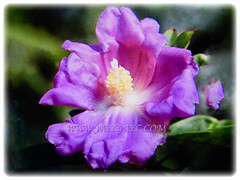 Botanical Name: Pereskia sacharosa (syn. 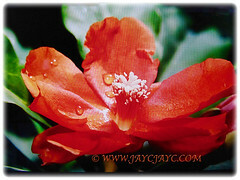 : Pereskia saecnarosa, Pereskia sparsiflora, Rhodocactus sacharosa, Pereskia argentina). 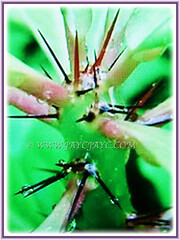 Common Names: Needle Seven Blade, Seven Star Needle, Rose Cactus, Tree Cancer, Jarum Tujuh Bilah in Malay. Etymology: The genus name, Pereskia is named in honour of Nicolaus Claudius Fabricius Peireskius, a 16th-century French botanist. Origin: Native to Brazil, Paraguay and lowland of the Andes in northwestern Uruguay region. 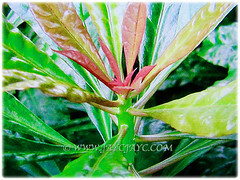 Features: Pereskia sacharosa is from the genus Pereskia that consists of about 17 tropical species and varieties of cacti. Unlike other members of the cactus family, this beauty is the only cactus genus that has persistent non-succulent leaves. A fast-growing tree-like or shrubby plant, growing between 2-7 m tall but generally up to 4 m in height. The plant produces large, petiolate and bright green leaves, measuring 2-20 cm long. Leaf surface appears wrinkled with the leaf blade bulging between veins. These elliptic leaves with wavy leaf margin are usually alternately arranged along the stems. The woody stems are heavily armed with dense clusters of black and needle-like spines. Areoles exist on the axils of the leaves, usually with wool and bear spines and leaves. The young primary areoles on twigs normally have up to eight spines while areoles on trunks usually have more, between 15-40 straight and usually black spines of unequal length. Rose Cactus produces highly ornamental flowers with about 10 obovate to oval orange-red petals that are arranged in almost the same manner as seen in roses. Bisexual flowers have a compact column of white stems and styles in the centre. The flowers are solitary or sometimes in inflorescences of 2-15 flowers. Flowers are 2-8 cm in diameter and usually coloured rose, purplish-pink, red or orange. 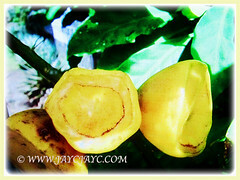 Eventually the flowers will be followed by unique, fleshy and funnel-shaped fruits, measuring 2-7 or up to 10 cm long that ripen into a yellow or bright orange colour with several small 2-7 mm, glossy black and disc-shaped seeds. 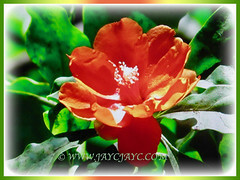 Culture (Care): Pereskia sacharosa or Rose Cactus can be easily grown with least maintenance. Light: Full sun for optimum growth and flowering. It does well in partial shade too. Moisture: M Moderate water requirements. Water regularly but do not overwater. Leaves drop easily during drought. Soil: Humus-enriched, loamy and well-drained soils. It does tolerate acidic soil. Prune for shape and branching. Feed once fortnightly with a balanced , water-soluble cactus fertiliser to promote healthy growth and flower production. Generally free from serious garden pests and diseases. Nevertheless, watch out for mealy bugs. 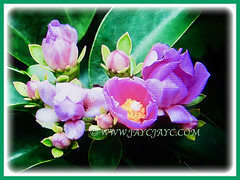 Pereskia sacharosa or Rose Cactus is considered frost tender. Surprisingly it’s cold hardy outdoors and very sun hardy for a succulent plant. It likes warmth temperature with recommended minimum winter temperature of 10°C. However, plants kept perfectly dry can survive low temps of approximately -3°C. For safe cultivation, it is best to avoid freezing temperatures. In the presence of high atmospheric humidity, avoid any frost as it is particularly sensitive to root rot. Deciduous below 4°C. Water regularly during the active growing season from March to September. No water should ever be allowed to stand around the roots. Keep almost completely dry in winter. It is drought resistant but leaves drop in dry conditions. Propagation: By seeds and stem cuttings. 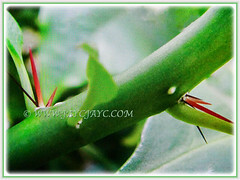 The cuttings should be planted immediately without a dry out period. 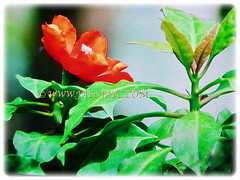 Usage: Pereskia sacharosa or Rose Cactus is ideal to be used as flowering hedges. Its highly ornamental flowers will be excellent in a flower bed or borders, as well as at public parks and gardens. Suitable too for container planting or above-ground planter. 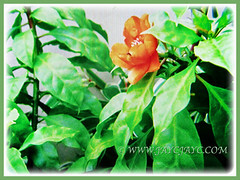 It is suited as a flowering and fruiting plant in balcony and corridor. Tree Cancer is said to have the ability to cure cancer especially colon cancer, nose cancer and several other diseases such as high blood pressure, diabetes, flatulence, rheumatism and ulcers. Leaves can be consumed raw as a side dish of salad. Also, can be made into a concoction brewed from fresh leaves and drink as tea.